Speeds aren't bad, but otherwise VROIS is an incompetent mess of a service. Avoid. 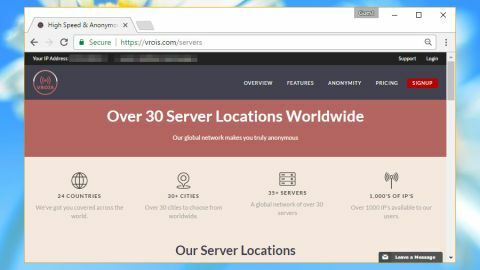 VROIS is a young VPN which, at first glance, seems to offer a simple, appealing service. There are 25 locations, no bandwidth or transfer limits, plus you get port forwarding support and five simultaneous connections, all for a reasonable $5.99 per single month (£4.80, AU$7.80), $4.99 per month (£4, AU$6.50) over a full year. Sounds great, until you start to browse the website, and problems begin to appear. The base Connect plan says it offers 25 servers, for instance, and a $9.99 per month (around £8, AU$13) Pro plan claims 50 servers – but it doesn't say where these are. The Network page mentions 35+ servers in 24 countries, and provides a list of ‘our server locations’. But this is only 22 items long, includes one location twice (London) and covers just 15 countries. This page also displays a ‘load’ value for each server, reassuringly low at 5% to 47%. Except these figures seem to be hard-coded into the page. They didn't change during testing, ever, and checking the page in Google's cache showed exactly the same figures. We gave up on the servers and started to look elsewhere, but the confusion continued. We tried clicking the ‘Download on the App Store’ and ‘Get it on Google Play’ buttons to check out the mobile apps, but neither of them took us to those respective app stores. A Google search helped us locate the Android client, but the service doesn't actually have its own iOS app (you must use OpenVPN). VROIS is very clear about its logging policy: ‘No logs ever’. The service doesn't log your online activity, so has nothing to hand over to the authorities even if it's asked. Just about every VPN service makes the same claim, so we also look for information on session logging. Some companies record your connect and disconnect times, bandwidth used, incoming and outgoing IP addresses and more. Often they'll spell out some details on this in the small print, but VROIS doesn't mention the issue at all. Was the company borrowing its small print from other web pages? We quickly found another example. The VROIS terms of service page has an unusual typo in a reference to an ‘acceptable user policy’, and Googling for the surrounding text found just one identical match: the terms of service for Incognito VPN. Looking more closely, we found the PSEUDiO and Incognito pages contained working links to an email opt-out page, a contact email address, an ‘acceptable use policy’, but the VROIS versions were all broken (web links pointed at vrois.com, the contact email address was legal@.com). It looks like VROIS has built at least some of its policy pages by copying and pasting text from elsewhere, but never finished the job. Whatever the explanation for all this, it wasn't inspiring any confidence. So far, VROIS was giving us far more reasons to run away than sign up. Creating a VROIS account looked like it should be a simple matter. Choose a plan, a payment provider, enter our name and email address – it's a completely standard procedure we've done thousands of times before. But as ever with VROIS, there were unexpected issues. We chose PayPal, approved the purchase, but the VROIS site displayed a ‘payment cancelled’ message. An email arrived from PayPal moments later detailing the purchase, so this simply wasn't true, but our VROIS account didn't recognise the payment. Time to test the support system. VROIS supports live chat, but it would take any agent time to check our payment details, so we created a new support ticket with our PayPal references. At least, VROIS claims to have a ‘ticket’ system, but we weren't given a number, or emailed a copy, and there was no way to view our ticket’s status later. Whatever the truth, the company seemed not to care that they'd taken our money without providing anything, and 12 hours later nothing had happened. VROIS provides a limited free service anyway, so we decided to try this out. The service offers one Android app of its own, and very basic setup instructions for Windows, iOS, OS X and DD-WRT routers. We clicked the Windows button and followed the directions to download and set up the standard OpenVPN client. It was good to finally have a list of 30 servers, even if they were named in just about the most jumbled and confusing way possible: there were cities, countries, places (Silicon Valley, Lake Elsinore), and Texas appeared four times (Texas, Texas 3, Dallas, Houston). Throw in an assortment of typos (Sweeden, Morroco) and the company somehow lowered the professionalism bar even further. Surprisingly, once we got connected, performance was better than average in our tests*. We connected from the UK to various European servers and our download speeds were almost always above 30Mbps. Chicago wasn't as impressive at 18Mbps, but even Singapore gave us 10-15Mbps. VROIS just might have a reasonable core network, but the service around it is so poor, so inept, and so unprofessional that we're struggling to care. Try the free Android app, maybe, but please don't give VROIS your money.